This was a double-blind, randomised, placebo-controlled trial in 215 elderly persons (mean age 88 years) living in 20 nursery homes in southern Sweden. The study objective was to investigate the effect of a daily intake of the probiotic L. reuteri Prodentis (L. reuteri DSM 17938 and L. reuteri ATCC PTA 5289) on the prevalence and counts of oral Candida in frail elderly patients living in nursery homes. 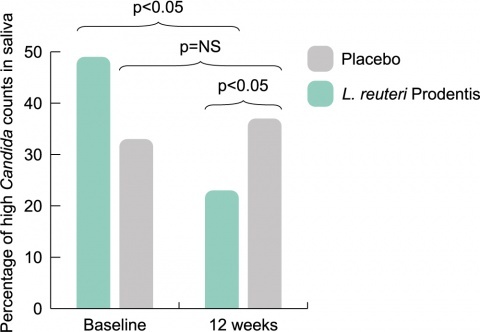 Patients were given two lozenges per day of either Lactobacillus reuteri Prodentis (n=95) or placebo (n=103) for 12 weeks. Primary outcome was measured as prevalence and amount of Candida growth. Secondary outcomes was measured as levels of dental plaque and gingival inflammation. There was a statistically significant reduction of 53% in the prevalence of high Candida counts in saliva in the L. reuteri Prodentis group but not in the placebo group, and the difference was statistically significant in both saliva and plaque (P < 0.05). Daily use of L. reuteri Prodentis lozenges may reduce the prevalence of high oral Candida counts in frail elderly nursing home residents. This indicates that probiotic lozenges may be beneficial for patients at risk for oral candidosis.